The capability of armed forces to employ ‘Kinetic effects’ by unmanned aircraft systems (UAS) have evolved in the past decade from science fiction into reality. Soon after the first Hellfire was launched from a Predator UAV on a test in February 2001, Central Intelligence Agency (CIA) operated drones were sent to Afghanistan to hunt Osama Bin-Laden and his accomplices. Since then, armed Predators became synonyms for the ‘Global War Against terror’, taking part in continuous warfare throughout Central Asia- from Somalia, Yemen and Iraq, to Afghanistan and Waziristan, in North-Eastern Pakistan. 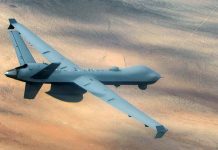 Today, more ‘Killer Drones’ are employed by a number of U.S. government services – taking part in covert operations, as well as by the regular military. Given the minimal ‘signature’ they generate before, during and after the attack, killer drones have become indispensable “tools” in covert anti-terror operations. Effective coordination and communications between sensors to ‘shooters’ become imperative, as operators on the ground continuously track the target through the drone’s ‘eyes’, assess potential collateral damage in real time, and finally approve action against suspected targets with minimal delay, thus minimizing the target’s ability in taking evasive actions. 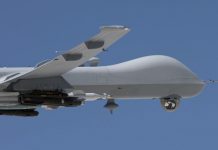 Drones armed with Hellfire missiles could be sent on specific ‘hunting’ missions, acting upon prior intelligence gathered by human intelligence (HUMINT) sources, or electronic intercepts of enemy communications activities (COMINT), or even by mere presence of covert electronic equipment ( unconfirmed rumors circulate, that U.S. intelligence has been using beacons known as RF tags in its attacks in North-Eastern Pakistan for some time). Over time, as drone attacks became more frequent, insurgents learned to deal with the new threat, by minimizing the use of wireless and electronic communications, seek cover by using ‘human shields’ and better blending into the local population. They established lookouts, warning on drones being spotted in the area, or when missile launches are indicated. 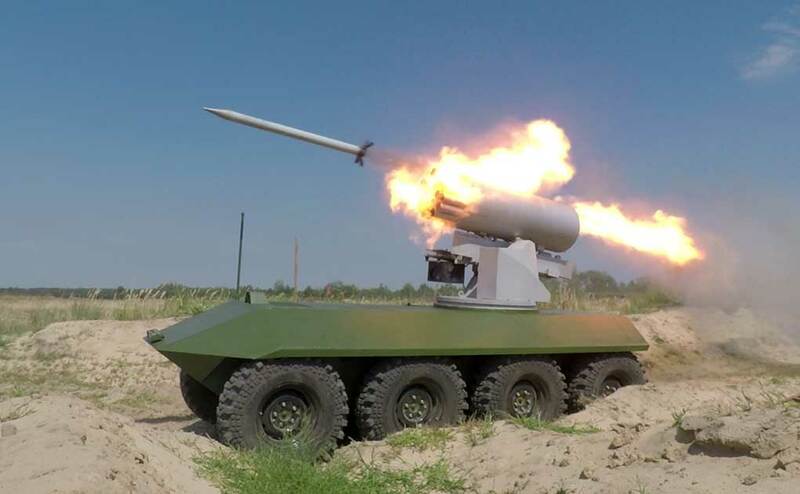 Since these drones had to operate at relatively low altitude to launch their missiles, Hellfire attacks could be spotted quite effectively providing insurgents the few seconds necessary to ditch the vehicles and run for cover. Another aspect challenging armed drone operations was retrieving the drone after a routine mission. When landing an armed drone was considered too risky, the expensive missiles had to be fired off the aircraft, before landing pattern begins. 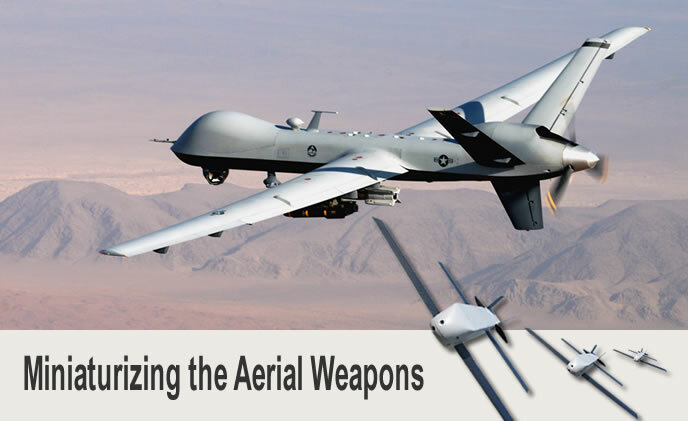 The first weapons used by UAS were derived from military off the shelf ordnance, hence, the choices of platforms was limited to those capable of carrying several hundreds of pounds of payload. Typical loads comprised of one or more missiles, Multi-Spectral Targeting System (MTS) stabilized electro-optical payload, communications segment and other mission-systems, bringing to a total weight of about 450 lbs (204 kg). However, as the weight of two Hellfire missiles reaches nearly 100 lbs (50 kg), not much is left for other mission systems, thus the choice of potential weaponized platforms was limited at the time, to aircraft capable of carrying 440 – 660 lb. 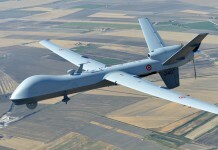 (200 – 300 kg) payload, including the US General Atomics’ MQ-1 Predator, or the IAI Heron UAV, (proposed for the U.S. services by Northrop Grumman). Three other platforms – the French Sperwer B from Sagem, the Israeli Hermes 450 by Elbit Systems and the MQ-5B developed by IAI and Northrop Grumman, all had payload capacity ranging from 200 – 350 lbs (90 to 158 kg), and thus incapable of carrying the only missile openly available for UAVs at the time Hellfire. 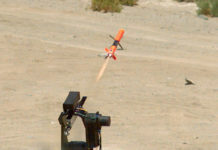 Several attempts to introduce lighter missiles on UAVs were publicized at the time, such as the integration of Rafael’s Spike LR on the French Sperwer. The Hermes 450 was demonstrated at airshows, carrying external stores, but its capability to carry weapons was never confirmed. Nor was the potential use of the Israeli IAI Heron, as a weaponized platform. The Hunter has also been adapted for weapon carrying missions, with the integration of two Viper Strike attached to underwing pylons. 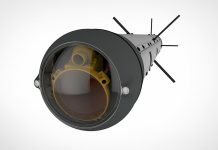 IAI has also developed the Lahat, a lightweight laser guided missile. A launcher carrying four Lahat missiles weighs below 150 lbs (68 kg), enabling light helicopters or larger UAVs to carry multiple weapons loads.